People experiencing mental health issues in Millom now have access to peer support sessions, thanks to a £5,000 grant from the NMP Community Fund. Mind in Furness run weekly ‘Safe Space’ support sessions from their base in Barrow. The sessions provide a safe place to meet, discuss issues and access support from trained staff and peers. The charity used the funding to extend their existing support service for people with mental health issues in Millom, where there are very few resources available to support people who are experiencing poor mental health. Millom is a 45 minute drive from the nearest large towns, Barrow and Whitehaven. Many residents in the area struggled to access the services in Barrow due to the distance and cost of travel. As well as the ‘Safe Space’ support sessions, the charity has also developed a six week recovery course and a six week mindfulness course to equip individuals with additional coping techniques and build on the peer support gained from the ‘Safe Space’ sessions. The charity has also carried out anti-stigma events in the community to help challenge the stigma surrounding mental health so people are not afraid to seek help if they are struggling with their mental health. Karen Dobson, Chief Officer of Mind in Furness, said: “Stigma was a major issue in such a small town where everyone feels they know everyone else and with some recent high profile tragedies involving mental health, there was a lot of stigma around accessing support. Karen described the positive impact these sessions have had on one Millom resident who was struggling with anxiety and depression. She said: “This individual had previously tried to attend our Barrow centre for help but struggled with travelling when feeling unwell. He is now a regular attendee at Millom. We have seen him grow in confidence and build relationships with his peers. 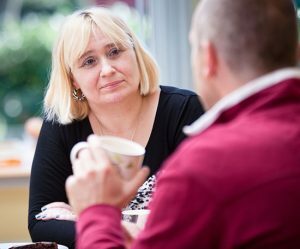 For more information on the support services offered by Mind in Furness, visit: www.mindinfurness.org.